The hot sauce you add to your eggs and chili did not cause your ulcer, but continuing to add it may not make you feel any better. Gastric ulcers are caused by a bacteria known as Helicobacter pylori. Diet may not be responsible for the painful stomach sores, but eating a balanced and healthy diet that limits foods that irritate your ulcer may help prevent flareups and pain. If any food irritates your ulcer, avoid it, even if it's considered a nonirritating food. Fruits and vegetables make a good choice when trying to limit ulcer pain. Include a variety throughout the week, especially green and orange vegetables such as broccoli, spinach, carrots and sweet potatoes to up your nutrient intake. 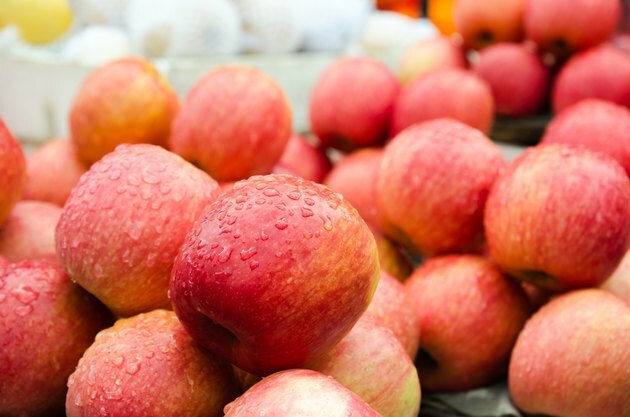 The flavonoids found in apples, cranberries, cranberry juice, onions and celery may help inhibit the growth of the H. pylori bacteria, according to the University or Maryland Medical Center. Additionally, the fiber in fruits and vegetables may help speed up ulcer healing. Grains, such as bread, rice and pasta, are also well-tolerated by those dealing with a gastric ulcer. Make at least half your grain choices whole grain to increase your fiber intake to help with the healing. In addition to fiber, whole grains are also a good source of essential nutrients you need for overall good health such as B vitamins, magnesium, iron and selenium. Examples of whole grains include whole-wheat bread, brown rice, oatmeal and millet. Foods high in fat may cause discomfort and should be avoided when you have an ulcer, so include dairy foods that are low in fat. Good choices include low-fat or nonfat milk, yogurt or cheese, buttermilk, low-fat ice cream or sherbet. If you do not tolerate dairy foods, soy milk may be an option for you. Milk does not coat the stomach to relieve pain, so it is not necessary to drink large amounts, according to MedlinePlus. Also include protein foods that are low in fat to limit gastric irritation. Poultry, seafood, lean red meat such as pork chops or strip steak, beans and tofu make healthy choices. Nuts, nut butter and seeds are a healthy source of protein but are higher in fat, so you may need to take some precaution when including them in your diet. In addition to fat, you also want to limit your intake of spicy foods and chocolate to reduce stomach acid production and ulcer pain and irritation. Caffeine found in drinks such as coffee and soda should also be limited, as well as alcohol. You should also avoid late-night snacking. ChooseMyPlate.gov: Protein Foods: What Foods Are in the Protein Foods Group?